You're going to LOVE this latest bit of news from the ranch... There's a new Hank book, but it's not part of the regular series! It's a book ALL about RANCHING! And, it's all told from Hank's perspective! This amazingly informative book is just as hilarious as the Hank books we all know and love, and you'll be amazed by how much you can learn about ranching in one sitting! For this one, author John R. Erickson has partnered with the National Ranching Heritage Center to create the "Ranch Life Learning Series" There will be 3 books in all, and in this first book, Ranching and Livestock, the same cast of characters from the Hank the Cowdog series will give you a first-class introduction to ranching! Through the eyes of a cowdog who knows his stuff—after all, Hank is the Head of Ranch Security for a pretty big cattle operation—you’ll learn about the difference between a ranch and a farm, how cows digest the grass they eat, what it takes to run a ranch as a successful business, how to choose the right breed of cattle for your ranch, and what it looks like to take care of cattle through the various types of weather ranchers face. And, what’s more, when you’re done with the book, you can test your ranching know-how with the quiz and vocabulary lesson in the back!" 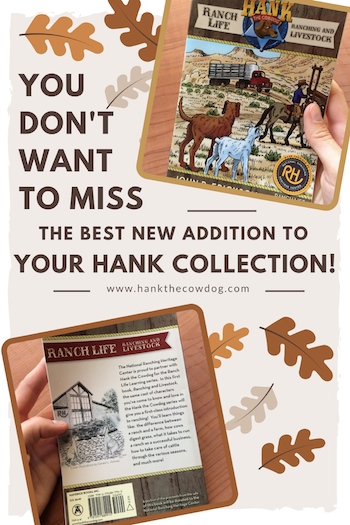 The book is available in Hank's store here: "Ranch Life Book 1: Ranching and Livestock", and if you have a Hank-fan in your life, this book will make a GREAT Christmas gift! It's a special addition to any Hank collection!